I love chenille and came across chenille quilts on Pinterest. I made the quilt using squares I bought and a chenille bedspread I had. I think I’m going to use more of the Bedspread for the backing, make it big enough to bring around the front and bind that way. But this is all an experiment for me, and I’m having trouble finding any instructions on any of this! I did find that they should be hand tied. My main question is: do I use batting in the middle? I live way upstate NY, this is going to my new grandbaby, and it is cold up here! I also assume old chenille quilts should not be used for sleeping, as I would imagine they arent fire resistant? Quilts are not fire resistant- cotton burns. Doesn’t matter if it’s old or new- regular cottons or chenille. even fabrics that have been treated - the chemicals used wash away. 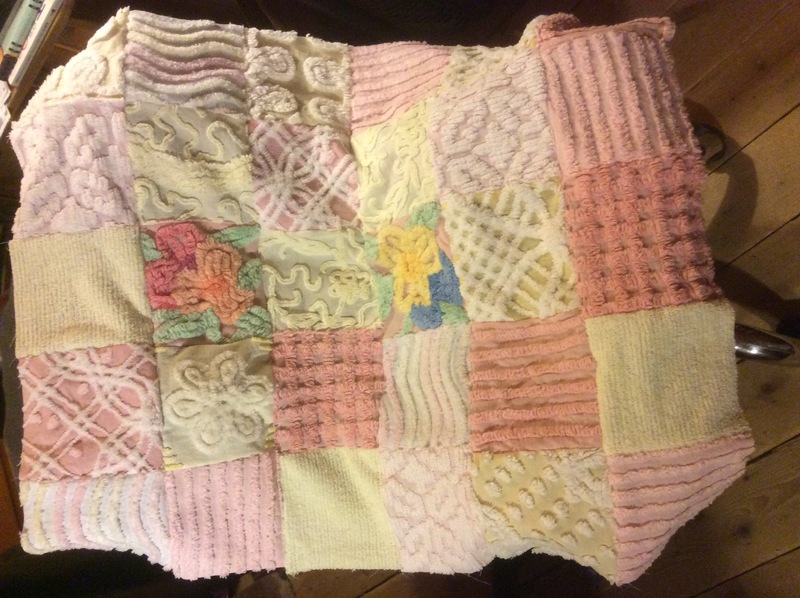 our local quiltshop carries chenille fabrics- I’ve made a few really wonderful baby/ kids Quilts using chenille and flannel squares. I do use batting and I quilt the quilts. They are warm, cozy and much loved. They launder wonderfully and just get better with age/ use. Thank you for all of that advice! And the fire resistant advice, as well. Much appreciated! Pretty! That will be such a soft cozy quilt. It does look cozy! I'm wondering, however, if using more chenille for the backing would make it way too heavy? I think I would go with a good quality flannel, and no batting. You could use a thin batting I think. That's really pretty! I love chenille too. I'm from upstate NY too and it gets very cold! Thank you! Im thinking of bringing the back to the front to bnd, which is why I was thinking more chenille. I would have to get a flannel to match, which I could do. I also think a good quality flannel for the back.